The SFMTA has recently re-timed traffic signals to give green waves for bicycle riders on three street segments: North Point from Stockton to Polk Streets, Folsom from 15th to 24th Streets, and Fulton from Laguna to Steiner Streets. With Bike to Work Day set for tomorrow, the SFMTA reviewed its completed projects in a press release today. It did not mention two other street segments announced in September: Arguello from Lake to Clement Streets and Potrero Avenue, from Alameda to 25th Streets. It’s unclear if those segments have been implemented yet, but so far six streets are known to have green waves in the city. The first three streets to get bike-friendly signal timing were Valencia, 14th, and 11th Streets. 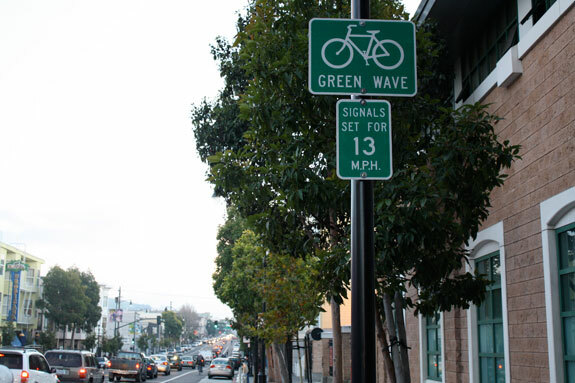 On all two-way streets that have received green waves, the signal timing works in both directions for bicyclists traveling at a “moderate pace,” usually around 11 to 15 MPH, according to the SFMTA. If you’re riding in for Bike to Work Day tomorrow morning, a rally will be held on the steps of City Hall at 8:30 a.m. The new timing on Fulton is not a welcome change. Previously, savvy eastbound cyclists would pause at Pierce and wait a second or two prior to coasting through signals at Steiner, Fillmore, Webster and Laguna down to the stop at Octavia. Yes some were flying down the hill, but now Webster is off by about 5 seconds meaning all momentum is lost and some excited riders are jumping into the intersection on red as they anticipate the green from the old timing. Most cyclists ride westbound on McAllister, so it’d be great if they could set the green wave to EB traffic traveling somewhere between 15-18 MPH. Like anything tweaks are always necessary, but I’d hate to see someone accidentally jumping Webster get creamed by a late yellow/red light runner. I similarly had to adjust to the new timing on North Point, starting from the top of the hill at Hyde. But you can still get all green eastbound if you time it right, and it’s finally possible to do so westbound. Yes! This has been a very difficult adjustment to make with the light at Webster WAY behind the pace of most cyclists descending from a significant elevation all the way from Scott. I’m not sure why an adjustment here was necessary. The only lag previously seemed to be between Webster & Laguna. I still don’t understand why the wave on Arguello is slated for really only 2 blocks. Why not carry it from Lake all the way to Fulton? Isn’t the eastbound 14th St green wave (at least on the first downhill block) signed as 20mph? Although I very much welcome these projects, I hope that the green wave on Potrero does not slow down Muni service. The 9 San Bruno bus line carries about 15,000 daily riders and is due to be improved under the TEP (with an objective, in part, of reducing the travel time). The 9L and 33 lines also travel Potrero. Green wave bike lanes are great as long as major Muni routes aren’t significantly slowed; Muni riders need all the help they can get to travel to their destinations in a timely fashion (so, shouldn’t Potrero have transit priority traffic signals? – or a green wave for buses). Much of the time bikes and buses end up leap-frogging each other, as buses may go faster than ‘moderate’ cyclists when lanes are clear of other vehicles but then they have dwell time at stops. Uphill gives the bus an advantage, downhill they tend to be the same (traffic willing). Muni already has the slowest transit in the nation. In DC when I rode my bike there I was usually faster than the bus. Look up the average speed of a Muni bus … seems like bicycle light timing won’t hurt. But signal priority for buses would be nice. Cool. These green waves are really helpful and just another step that gets more people on bikes. However, why can’t the City sign them more prominently? On Valencia, for example, I think there are 2 signs and they are *tiny*. I bet the vast majority of motorists never see them … and that is manifested in the inanity of every single motorist racing from red light to red light and somehow not figuring out that: “Hey, all those cyclists always catch up to me each light. Maybe I should just slow down and stop racing to red lights?”. Why can’t the city do a better job getting the word out that lights are timed and motorists should slow down because it isn’t helping them and just jeopardizing the safety of everyone else? It would be nice if Folsom in SOMA could get better timing with the awesome separated bike lane. Right now, it’s timed for something like 25 or 30 mph (I don’t know for sure because I can never go fast enough to confirm!). Since I recognize that we won’t be ending the ridiculous freeway nature of streets in SOMA anytime soon, there’s probably no way the city will time them to 15 mph. But how about 20 mph? I’ll never make a complaint like that on a city arterial given how frequently I might complain that motor vehicles go too fast and the speed limit should be lowered. I get frustrated too, say for example I would want Valencia to be more like 16 MPH but then I let my zen kick in. It might be tough to do when you note that the green light cycle when Arguello crosses Geary has to be a LOT longer than crossing a street like Lake – Geary is so wide that the pedestrian countdown starts at something like 25. If they are timed, then *all* the streets have to have the same green cycle. The green wave on Valencia is 13 MPH. MUNI’s fleet average is what, 8 MPH? I think we’re good. Given that MUNI will stop every other block and the dwell time is random, MUNI buses will only see one light in between stops and whether it hits it green is basically random. I agree these need to be signed much better. When you have a new traffic control which only exists on a handful of streets in San Francisco, and almost nowhere else, there’s no reason to expect motorists to intuitively figure it out. Staff at SFMTA worked together to make sure the timing would not negatively affect the bus routes on Potrero, Folsom, and North Point. We’ll keep an eye on the bus speeds to make sure our analysis proves correct. Thanks for bringing this issue up! These are great! Here are two stories…most recently, I started at 14th/Market, went down 14th, right onto Valencia and, while cruising at an easy, no sweat pace with no big accelerations or decelerations, did not catch a single red until Mission/Valencia, almost 2 miles away and through 16 signals. (The last couple signals weren’t on a wave but happened to work out) Other story is that I was riding my bike running errands before my daughter’s soccer game in the Mission and was running late after one too many errands but purposely took Folsom because of the green wave, never stopped, and made it to the field right at the opening whistle. Go Green Waves!